There’s no doubt this picture was a challenge to audiences from the outset. The opening 25mins featured the actions of four separate, seemingly unrelated characters from four different countries around the world. There’s an assassination of a wealthy man by an unassuming Mexican hitman; an Arab terrorist who blows up an Israeli building; a French businessman desperately trying to backtrack on some kind of fraudulent business deal gone bad; and a gangland driver caught in the crossfire of a mob-related war in New Jersey. Each of these sequences, plotted out with maximum intrigue and mystery, directed like four different films, figures only as preamble to the story of these same four men who seek refuge in an unnamed desolate South American village. It isn’t until the midpoint of the film when the foursome, receive the assignment of driving two trucks filled with highly sensitive dynamite, across the treacherous rain forest with the mission to blow up a damaged oil refinery. It’s easy to see the patience of the audience tested through this lengthy set up, however mysterious and intriguing. It’s easy to see American audiences alienated by the strange company of international actors (with the exception of Roy Scheider) playing these gruff refugees. And it’s easy to see American audiences put off by Tangerine Dream’s strange electronic music score, one the first of its kind in a mainstream American film. 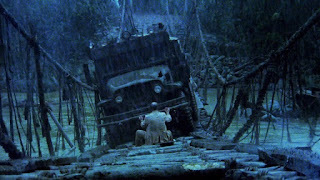 The second half of the picture is an undeniable masterclass of sustain tension and action filmmaking as Friedkin crafts a series of thrilling sequences from the preparation sequences before setting off on the journey to the half dozen action set pieces expertly staged and executed with thrilling realism. The expert hands of editors Bud Smith and Robert K. Lampert deserves much of this credit. I’d argue the picture as being a masterclass exercise in montage editing. 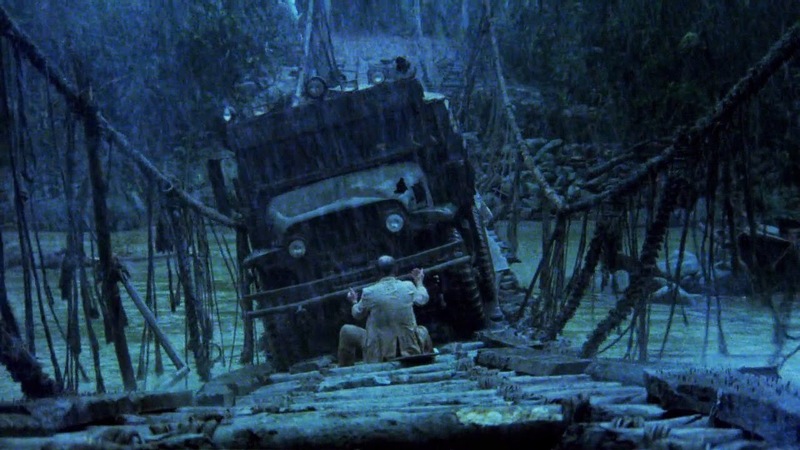 While the audacious execution of the famous bridge sequences is bold in its glorious wideshots of the trucks swinging perilously over the river, the expert editing of Friedkin’s carefully curated close-ups amplify the terror to Hitchcock levels of suspense. The competition sequence early on where we see the various villages vying for the lucrative job of driving the trucks, with today’s eyes, looks like guidebook of montage filmmaking used by action filmmakers in the 1980’s and beyond. In fact much of the picture is cut with the same rhythm of montage editing, creating an elegant kind of flow commonplace in most of today’s commercial action films. Thus, Sorcerer feels years ahead of its time, working on another level of cinema yet to be imitated, borrowed, and even lampooned (see montage sequences in The Evil Dead). Thankfully Sorcerer is now celebrated and Friedkin deservingly vindicated.